The executive summary describes the purpose, goals, methods, major findings, natural resources, issues and objectives, hydrology, ecosystems, stewardship, circulation and site designs, concluding with a paragraph summing up the benefits of a Ventura River Parkway. The executive summary is followed by the Table of Contents which lists the separate parts of the document and the topics covered within each part. The introduction includes a description of parkways in general, an overview of the parkway project, the sequence and content of this document, existing policies and plans that support and relate to this plan, potential funding sources, a brief history of the area concluding with a paragraph describing how the river reconnects people with nature. This chapter begins Part 2 of the document which covers inventory and analysis of the features of the Ventura River Valley and Watershed. Chapter 2 focuses on physical features beginning with geomorphology of the Ventura River watershed, soils composition, natural hazards and climate. This chapter examines the hydrology of the Ventura River watershed from the headwaters to the estuary, surface water resources, ground water resources, fluvial morphology, flooding, water supply and demand, impacts of development in the flood plain, water quality and impacts from the water treatment plant and human activities adjacent to the river. This chapter describes the processes of an ecosystem, ecosystem based management, the importance of biodiversity, California’s native plant environment, landscape ecology, vegetation, urban-river interface, ecosystems within the parkway area, invasive plant species and critical species in the plan area. Chapter 5 provides an overview of cultural resources separated into three categories: land use and circulation, community resources, and sensory resources. Sensory resources are divided into three zones by microclimate and viewshed experience provided from the north end of the river to the estuary. This chapter also covers services, historical resources, the arts, community stakeholders, demographics, the local economy, community organizations, community meetings and surveys about the plan community experiences and concerns like loss of open space, accessibility to recreational areas, contamination from industrial uses, public perception of the river and homelessness. Chapter 6 examines the interface between ecosystems, hydrology and people. It reviews resources available on the topics of restoring and renewing ecosystems and planning communities to live in harmony with the natural environment. It reviews other similar parkways projects across the U.S., and specific issues, objectives, opportunities and constraints of this project. This section covers the elements of the plan, beginning with hydrology, restoring tributaries and ensuring adequate instream flow, eco-friendly neighborhoods, flooding, improving water quality, restoring ecosystems, wildlife corridors, native plant and steelhead restoration, building stewardship of the river and minimizing incompatible uses. The Circulation Plan includes uses of existing highways, roads, bridges and the development of a new trail system along the river with trails designed for various uses. The concept plan describes access points within the existing Avenue community which will allow pedestrians to visit the river. The goal of the circulation plan is to make it convenient and pleasurable to enjoy the expanse of the Ventura River Parkway, provide river views and access to the river. Foster Park will serve as the gateway to the north end of the Parkway. This chapter describes enhancements to the park to provide greater access to the river and improve facilities to attract a greater number of visitors and includes discussion of improvements to bicycle and pedestrian access, improved river access, a swimming hole and new signage. This chapter describes the existing community and presents a vision of a park with trails, picnicking spots and other facilities. It includes an arboretum at the confluence of Canada Larga Creek and the Ventura River, restoration of riparian habitat, suggests ideas for the future of the Ojai Valley Sanitary District Wastewater Treatment Plant, the old USA Petrochem site, preservation of the Mission Aqueduct remnant at the confluence, incorporation of the Brooks Institute and existing open space surrounding those sites. Also included is a discussion of necessary remediation at the old Petrochem site due to groundwater contamination. This chapter concentrates on access to the west side of the river, an undeveloped area between terraced land on the bluffs and the river on the Taylor Ranch property accessible by a dirt service road. Since this property is privately owned, this part of the vision will require working diligently with the landowner to bring this concept plan to fruition. The Downtown Delta describes an area surrounding the interchange of the 101 and 33 highways. It includes a portion of the lower Avenue, the western hillsides, Westpark, the downtown, the fairgrounds, Emma Wood Group Camp and the Ventura River Delta. This chapter describes a Ventura River Parkway interpretive center, access to the parkway from Westpark, the historic Ortega Adobe neighborhood, expanding the estuary to allow wetland restoration, reconstruction of the railroad trestle and addition of an adjacent trail. The Ventura River Parkway Vision document is conceptual in nature and designed to be a tool for governmental and non-governmental organizations to use in development and implementation of the Lower Ventura Parkway. This chapter presents a concise grid of design solutions organized by hydrology, ecosystems and cultural elements. Also included are recommendations toward the successful implementation of the Parkway Vision plan with the goal of restoring the environmental health of the Ventura River. This appendix describes the complex environment of California water law (with references). This appendix explains the marine environment of the Santa Barbara Channel, urban pollution and landscape architecture strategies for reducing the impact of urban development on the marine environment (with references). 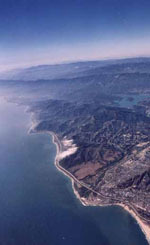 Appendix C covers the Coastal Conservancy’s key role in the process of developing the Lower Ventura Parkway Vision Plan.